Hello India! I thought it would be nice to spice things up a bit for dinner tonight. 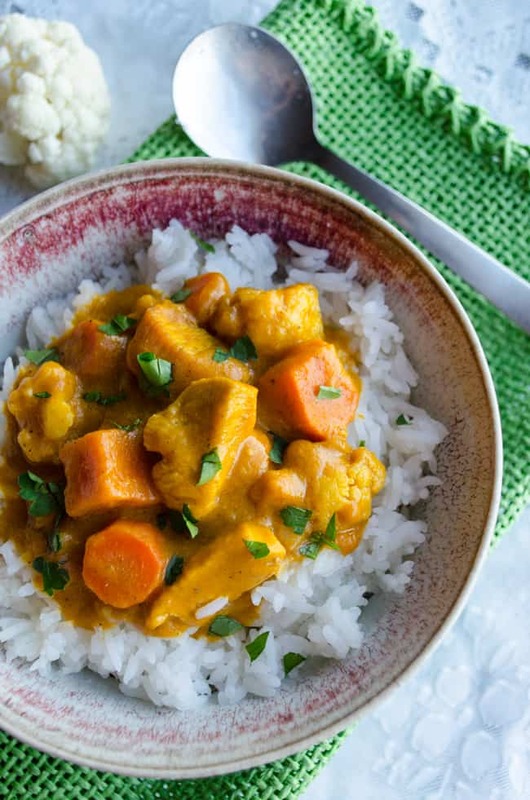 Coconut Pumpkin Curry is an easy weeknight dinner that is a fun departure from the standard American ‘meat and potatoes’ entree. When I get stuck in a rut change is so welcome and refreshing for me! 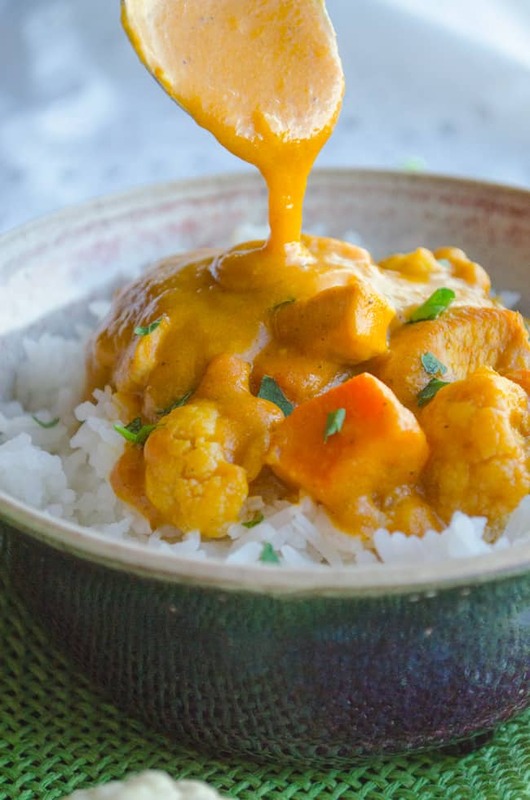 And if you have more of a mild tongue don’t worry, Coconut Pumpkin Curry is packed with great flavors that aren’t overwhelmingly hot. See the photo above? That is pure liquid gold right there. Yes sirree. Coconut Pumpkin Curry Sauce would probably make just about anything taste good. But I like it with traditional sweet potato, cauliflower, chicken and carrots. 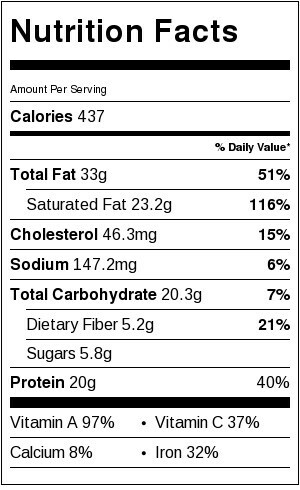 Of course you’re free to expand or switch out your vegetables or protein if you like. These particular vegetables are great at soaking up all the flavors of the Coconut Pumpkin Curry Sauce. And I serve mine over fragrant sweet Jasmine rice. If you haven’t yet tried Jasmine rice, once you do you’ll never buy another white rice. It’s terrific! One thing in particular that I love about this recipe for Coconut Pumpkin Curry is that it’s full of garden vegetables that you can grow right in your backyard. All you would need to fetch from the store is coconut milk and the spices; curry paste and garam masala. If you’re not familiar with garam masala, it’s an indian spice blend that is common in the supermarket spice isle. Oh, and I must not forget the fresh lime! The fresh lime juice really brightens and lifts the whole flavor of the curry and gives it an authentic taste. It’s a bit more difficult to track down traditional Kaffir lime leaves that are used in Southeastern Asian Cuisine; regular lime juice does a nice job as a substitute. 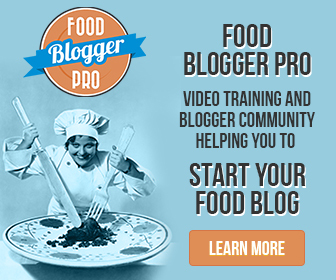 Give this recipe a try tonight! As always, drop a comment below and tell me about your experience :0) I’d love to hear about it! 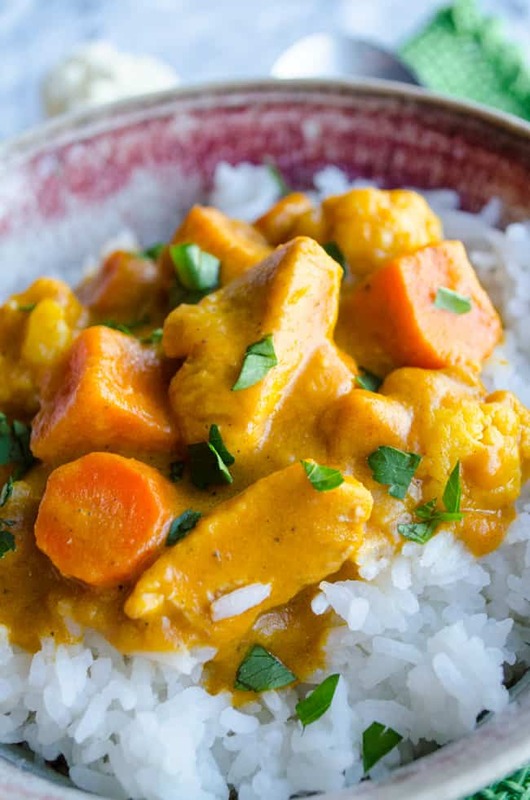 Chicken and vegetables cook in a rich sauce of Asian spices, pumpkin and coconut milk for a wonderfully easy weeknight dinner recipe packed with flavor. Prepare and measure out all ingredients. In a large dutch oven heat oil over medium high heat. Add chicken and season with salt and pepper. Cook for about 1 to 2 minutes, just until browned on one side. Add in the curry paste, minced garlic and garam masala. Stir around to coat the chicken and bloom the flavor of the aromatics, about 30 seconds. Pour in the coconut milk, chicken broth, pumpkin puree, sweet potato, onion, carrots and cauliflower. Bring to a simmer around the edges, cover, and turn the heat to medium low. Cook for about 25 minutes or until the chicken is done and the vegetables are soft. Off heat, stir in the juice from the lime. Serve over cooked rice.